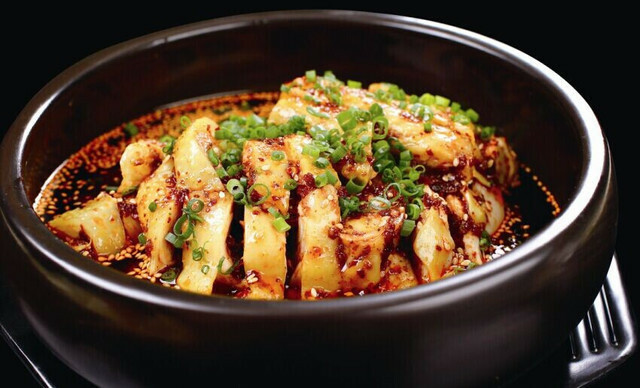 The cuisine of Sichuan province is notoriously spicy, so be prepared for some sumptuously sizzling snacks! As one of the Eight Great Culinary Traditions of Chinese Cooking, this style is celebrated throughout China, and is widely available both inside and outside of the country. While it’s well-known for its liberal use of fiery chillies and numbing Sichuan peppercorns, it employs a wide variety of ingredients to imbue each of its dishes and snacks with a unique flavour. Fermented and preserved goods add a smack of sourness, sugar brings a touch of sweetness, well-salt from Zigong gives a salty tang, and mashed garlic injects a pungent punch to every dish. 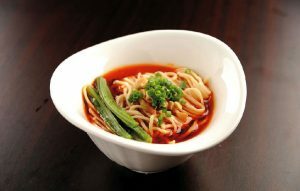 There is an old local saying in Sichuan which goes: “one dish, one flavour; one hundred dishes, one hundred flavours”. It’s a cuisine celebrated for its boundless variety, from blazing heat to aromatic freshness. These flavours are rarely used alone, but are instead intermingled perfectly to form a taste sensation that is unlike anything you may have ever experienced. The real joy of Sichuan cuisine is that no two dishes taste alike, and every meal represents a new culinary adventure! Swimming in chilli oil and teeming with delicious toppings, Dan Dan Noodles are the ultimate icon of street food in Sichuan province. The name refers to a type of carrying pole known as a dan dan, which vendors would use to carry their ingredients. One basket would contain the noodles and the other the sauce, which would be deftly combined anytime a passer-by fancied a taste of this cheap snack. These street vendors played such a significant role in the dish’s popularity that it eventually came to be known as Dan Dan Noodles or “Noodles Carried on a Pole”. Unlike other noodle dishes, the seasoning for Dan Dan Noodles is normally placed at the bottom of the bowl and then stirred into the noodles. The sauce is made up of preserved vegetables, chilli oil, dried chillies, soy sauce, garlic, Sichuan peppercorns, minced pork, and spring onions, which makes for a rich blend of spicy, sour, and pungent flavours. The noodles are ladled on top of this fragrant mix, but it’s usually up to the customer to blend them together thoroughly. After all, you’ve got to do some of the work yourself! Often referred to as Bon Bon Chicken, this flavourful poultry dish is popular throughout China. Don’t worry, this chicken is not armed and dangerous! The name derives from the banging sound that is produced when the meat is being tenderised with a rolling pin. According to local legend, sometime during towards the end of the Ming Dynasty (1368-1644), there was a dedicated chef living in a remote area near the city of Ya’an. His favourite practice was to experiment with new ingredients and flavours. After studying and practising the art of soup-making for many years, he finally invented a recipe for the perfect chicken broth. However, back in those times, chicken was a luxury and was usually only served during festivals. Fortunately, the chef came up with an effective solution: cut the whole chicken into thin slices and then sell it slice by slice! His chicken slices soon became extremely popular throughout the province, but this led to another problem. The chef couldn’t cut the chicken up evenly with a kitchen knife, and his customers would often complain if their slices were too small. In the end, the answer was to beat the chicken into pieces, which also helped the broth to infuse into the meat. Nowadays, Bang Bang Chicken is normally served with a light salad. The chicken is first boiled in a large pot, along with slices of fresh ginger. Once the chicken is thoroughly cooked, the pot is removed from the heat and the chicken is left to soak in its own broth. Finally the chicken is beaten with a rolling pin and shredded into small pieces before being smothered in a tangy sauce made from Sichuan peppercorns, soy sauce, black vinegar, sugar, chilli oil, salt, and chopped spring onions. This fiery mixture is perfectly complemented by cool slices of cucumber and juicy tomato. 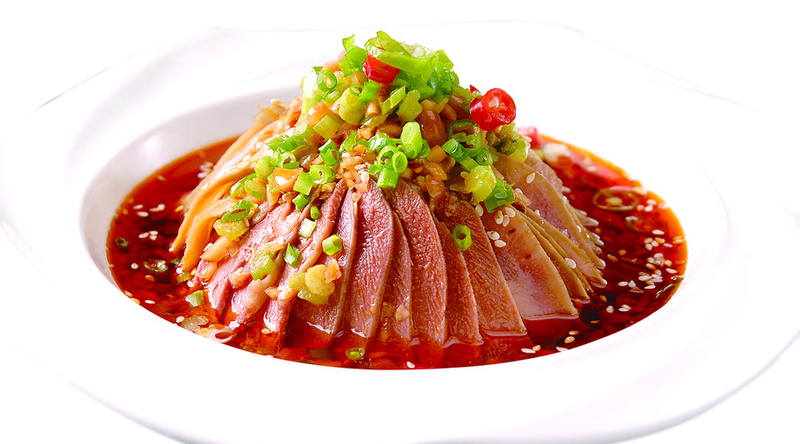 Tea-Smoked Duck is an example of a traditional Sichuan dish that existed long before chillies became popularised in the region. It is typically eaten at banquets or during festivals, since it is infamously complicated to prepare. The duck is first marinated for several hours with a rub made from crushed Sichuan peppercorns, rice wine, ginger, garlic, and salt, much of which is liberally applied inside the cavity of the duck. Sometimes tea leaves and camphor leaves are added to this rub to give it an aromatic kick. After it has been left to marinate, the duck is quickly blanched in boiling hot water to tighten the skin, and then air-dried. This ensures that its skin will turn wonderfully crisp when cooked. 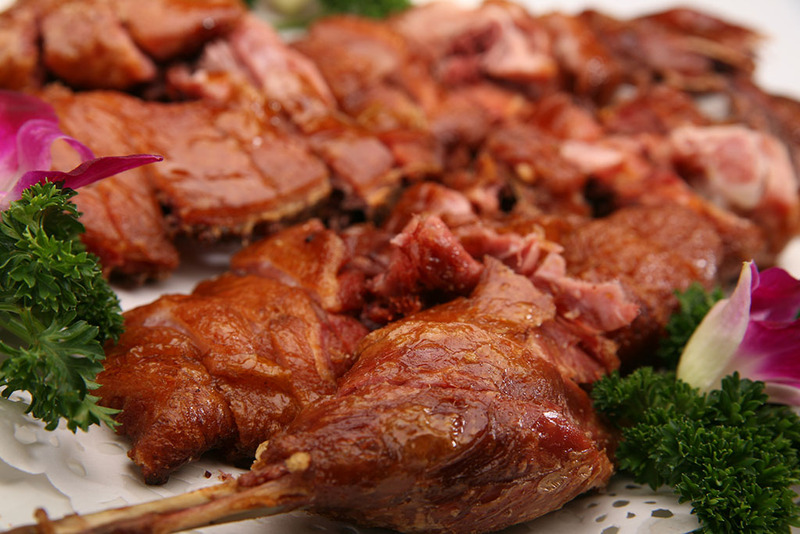 Once the duck is completely dry, it is smoked over a wok full of black tea leaves, camphor twigs, and camphor leaves for approximately 15 minutes. In order to ensure the meat is deliciously moist and thoroughly cooked, it is then steamed for a further 10 minutes before being deep-fried until the skin turns a crispy golden brown. With its subtle aromas, sour tang, crunchy skin, and tender meat, this dish is sure to be everyone’s cup of tea! Before you panic, no married couples were harmed in the making of this dish! Much like Bang Bang Chicken, the unusual name derives from an equally unusual local anecdote. During the late Qing Dynasty (1644-1912), it was a common sight to see vendors on the streets of Chengdu selling cold slices of offal, since it was one of the most inexpensive cuts of meat. Its low cost meant the snack quickly became popular amongst rickshaw pullers and poor students. However, during the 1930s, this simple dish would soon be revolutionised! A man named Guo Zhaohua and his wife, Zhang Tianzheng, were very particular about the way they prepared their beef offal slices, and often experimented with new ingredients. This set their beef slices apart from other street vendors in the city, and soon their business started booming. That being said, with great power comes even greater annoyances! Because they were so well-known, mischievous children in the city would often stick paper notes to their back that would read “fuqi feipian” or “married couple’s lung slices”. Eventually, this phrase became so commonplace that it was adopted as the dish’s official name. Oddly enough, the dish itself is rarely made from lung slices. Normally thin slices of cooked beef tongue or tripe are used instead, and are served in a vinaigrette-like sauce made from spiced broth, chilli oil, Sichuan peppercorns, roasted peanuts, chopped garlic, and chopped spring onions. This sauce is just thin enough to coat the papery slices of offal perfectly without overwhelming their natural flavour, providing an appetizer that tastes fresh, spicy, crunchy, and mouth-wateringly moreish.